We triathletes all know that our optimal cadence is 90-95 right? Or so the literature tells us. Here’s an interesting test to do. You will need a turbo trainer and be able to record either speed or power as well as cadence and HR. We won’t be changing the resistance on the turbo so speed will be a proxy for power. We are going to choose a power and stick to it for 30 minutes and have a 5 minute gap between the two 30 minute intervals. The two 30 minute intervals are non-stop. It is essential for you to believe the results of this test that you warm up properly ie 15 minutes. You should get your heart rate up to the bottom of zone 3 at least for a little while and you should be hitting >120 cadence – both in the warmup. As part of the warm up work out the lowest gear that you can do the chosen power at. The lowest gear is the one with the biggest rear cog. It doesn’t matter what the front one is on. But you are going to get a higher and higher gear throughout this exercise so you will need to be able to shift to 4 smaller cogs from the starting one. So let’s say you can do 250W at 101RPM. Let’s go…press the lap button at the end of each 5 minutes. The following RPMs are made up you pedal at the required cadence to maintain the power in each gear. Have 5 minutes rest or easy spin and the repeat the 6 consecutive intervals exactly as above. So what results would you expect? I would have expected the first 5 minutes to get my HR properly up to the ‘right’ rate so that the next 5 intervals are a meaningful look at HR changing with cadence. I would then expect my heart rate to be lowest at 93RPM (in the above example). I would imagine that fatigue may play a difference throughout the exercise and so towards the end of the 30 minutes my HR might start to drift upwards. I would have thought the second 30 minute set would have a more pronounced HR deterioration due to fatigue. A few mates and I tried this after reading about it on one of the forums and were all VERY surprised with the results. Try it. When I did this I found that my ‘optimum’ cadence was MUCH, MUCH lower than I expected. As did 3 out of 4 of my mates (I only have 4). The 4th was a VERY good cyclist. In fact this test told one of my mates that the lowest HR was achieved in the 60s RPM/cadence. 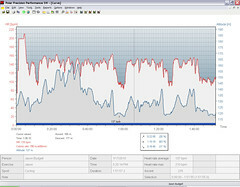 The lowest HR does not give you your target cadence for a race. But I reckon it gives you an indication that your optimal cadence may well be lower than many of the Pros and lower than some of the accepted wisdoms of triathlon. Lower than you are aiming for currently as well perhaps? If you repeat the test at higher power levels you might not find the HR reduction at lower cadences to be quite so great. There are also other factors that you need to take into account and I urge you to read around a bit before committing to too low a cadence. This certainly made me lower my target HR for races to the high 80s rather than the mid 90s. I’m going to try this for a few PBs in the coming months and we will see what happens. Just came across this post through a suggested link on the website. How did you end up going with the lower cadence? I’m interested to give this a try too, although I do wonder whether it’ll change the balance of your fuel usage as the lower cadences would use the fast twitch fibers more… so you may fatigue earlier? I’m finding it’s good to switch cadences around on multi-hour rides, seems to give you a break.